Andy Gorman on his farm, Cincy Urban Farm, in Sharonville. 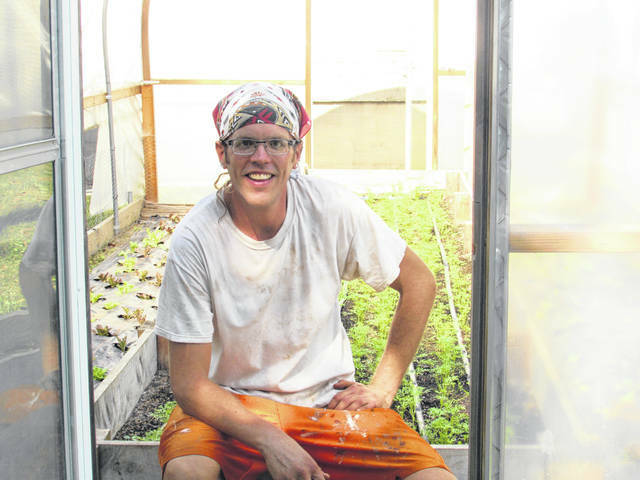 Andy Gorman in his high tunnel at Cincy Urban Farm, currently filled with winter crops. Andy Gorman’s honey beehives at his farm, Cincy Urbana Farm in Sharonville. SHARONVILLE — Three years ago he had no idea he wanted to be a farmer. His family weren’t farmers and his property neighbors a library, a school and is surrounded by a creek in town. Now Andy Gorman, owner and farmer of Cincy Urban Farm, farms full-time on land that has been in his family since 1941. 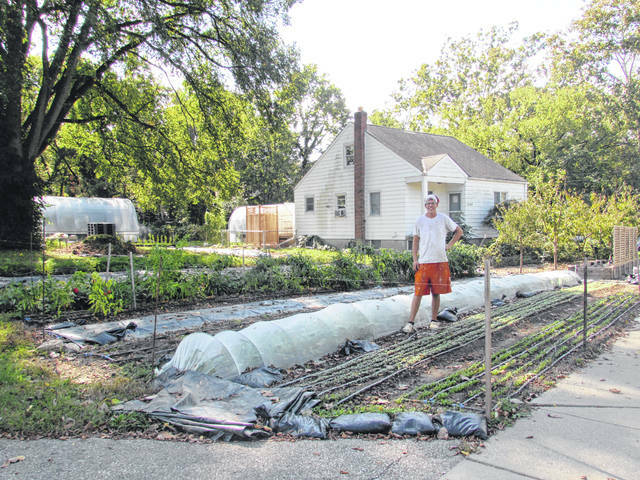 He grows vegetables, fruits and herbs on one-eighth of an acre in the Cincinnati area. “One of the best parts about urban farming is the publicity, the social equity I get from people walking and driving by the farm,” said Gorman, just minutes after someone beeped their horn at him to wave hello. Before he started selling at farmers markets Gorman would set up in his driveway and sell his products from there. “My dad grew up on this property. None of this agriculture was here during that time,” said Gorman. However, this year he purchased additional land, which encouraged him to start farming full-time. Gorman is a one-man team: growing, harvesting, building, and selling all himself. This is Gorman’s second year making a living as a farmer. His first time growing anything was in 2013 when he switched to a plant-based diet. Gorman sells at two farmers markets a week: Deerfield Farmers Market every Saturday morning and Wyoming Farmers Market every Tuesday from 4 to 7 p.m. Both markets are in the Cincinnati area. “I didn’t know I wanted to be a farmer until two or three years ago. I learned everything from YouTube, a few books and talking to farmers,” said Gorman, adding that experience is his biggest teacher. He was also inspired by Guy and Sandy Ashmore of That Guy’s Family Farm, whom he met at the Deerfield Farmers Market four or five years ago. “It makes me happy when I inspire people [to grow] because that’s what Guy and Sandy did — they inspired me,” said Gorman. The first time Gorman met the Ashmores they invited him out to their farm. “They took forty-five minutes to an hour out of their day to show me around the fields. That meant the world to me,” said Gorman. “I like growing food, but if I could grow farmers — that would have a bigger impact,” said Gorman. Although Gorman is not certified organic, he uses organic growing methods and practices. Gorman sources all organic seeds and uses organic compost and soil both in the fields and when growing micro greens. “I practice crop rotation and give back to the soil every year with a healthy application of compost,” he said. In addition to farming, Gorman builds furniture, commissions other woodwork and teaches in the winter. He majored in wood technology at the University of Cincinnati, where he now teaches a furniture construction class every Wednesday. Gorman is the market manager at the Deerfield Farmers Market, which is located at Kingswood Park in Mason, 4188 Irwin Simpson Road 45040. The market is open every Saturday from 9 a.m. to 12 p.m. through the end of October. The winter market will begin in November and last through April, every 3rd Saturday of each month, 10 to 11 a.m. at the same location. Gorman has two high tunnels, which are both full of tomatoes in the summer months. He currently has his winter crops planted in the tunnels, including carrots, radishes, spinach, kale, and lettuce. He will harvest these crops throughout the winter. He began gardening with a permaculture mindset, a system that is self-sufficient and centered around the design of natural ecosystems. “I kind of wanted to have it all,” said Gorman, talking about when he first started. “So now as I grow bigger I have to tailor back what I do and focus on the things that are really profitable.” At the farmers markets, tomatoes and microgreens are his best sellers. Gorman recently transitioned his guest room into a space to grow microgreens. He used to grow them in his living room. He also has peach, cherry, apple and fig trees, which he doesn’t sell to the public, but grows for himself. Gorman jars jellies, using his own and locally sourced berries. He grows blackberries, raspberries, black raspberries, and strawberries. Gorman has three beehives on his farm. Two were packaged beehives he ordered from Georgia this year. One was a wild swarm, the first he had ever caught. “It was an experience,” he said, referring to catching the wild swarm that was 12 feet high in a honeysuckle tree. He does not harvest the honey, but has the bees to improve pollination efforts in Ohio and increase the honey bee population. Gorman said that the biggest hurdle he has faced so far as a farmer has been local government regulations. He used to have raised garden beds in his front yard, but a public right-of-way goes into his property about 2 feet where those raised beds were. The city passed an ordinance stating that Gorman had to take these down and that no one was allowed to have a garden in their front yard. “They ended up telling me I had to take them down. I ended up taking them down. I fought for a year and a half and there was nothing else I could do. I had 700 plus signatures, I had the news out here, just to try and save it. I had the whole community behind me,” said Gorman. Gorman said he should be allowed to keep them because “they’re to grow food in.” Now he has plants in the ground instead of in raised beds. The ordinance also stated that the plants cannot be taller than 8 inches. He put between $600 to 800 in each of the two beds he had to take down. He said he made them aesthetically pleasing and put a lot of time and money into them. He plans to build a second lean-to on the back of his garage, where he will add a second walk-in cooler to store, wash and pack what he harvests. This should be done by the end of this year. A lean-to is a type of simple structure added to an existing building with the rafters “leaning” against another wall. Gorman also uses tanks to collect rainwater that runs off his garage and house roofs. He mainly uses the rainwater for his perennial garden, which is more like his personal garden. It includes some berry bushes, mint, tomatoes, beans, and other plants. For the rest of his crops he uses city water. He has a five-year contract for a plot of land at Ell Farm, located in Cincinnati. The plot is 80 by 60 feet and Gorman will plant and harvest on that land in the spring of next year. In the future, Gorman would like to sell wholesale to restaurants and maybe even work with the schools near his farm. https://www.rurallifetoday.com/wp-content/uploads/sites/56/2018/11/web1_FarmerAndy.jpgAndy Gorman on his farm, Cincy Urban Farm, in Sharonville. https://www.rurallifetoday.com/wp-content/uploads/sites/56/2018/11/web1_FarmerAndy2.jpgAndy Gorman in his high tunnel at Cincy Urban Farm, currently filled with winter crops. 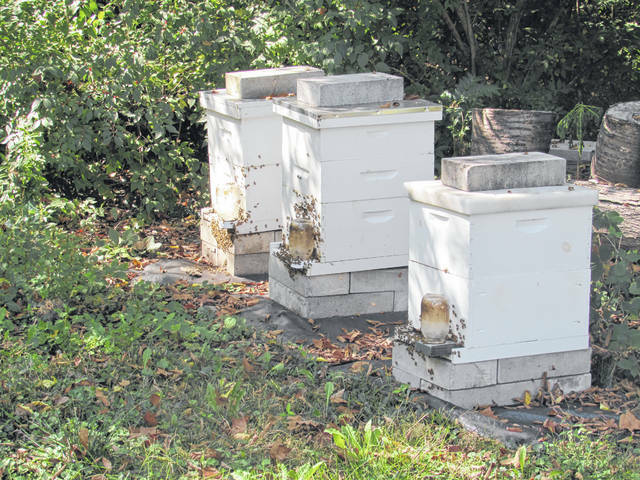 https://www.rurallifetoday.com/wp-content/uploads/sites/56/2018/11/web1_Bees.jpgAndy Gorman’s honey beehives at his farm, Cincy Urbana Farm in Sharonville.